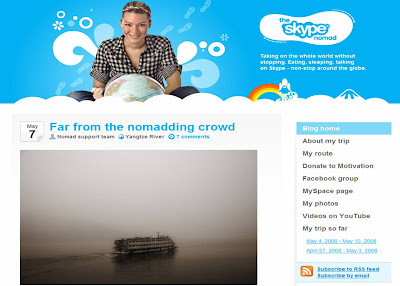 According to the Skype blog: "She'll be hopping from jet to rickshaw and bumboat in Singapore to a Fogg-esque hot-air balloon over the Alps in Austria, to gondola in Venice, a boat cruising the Yangtze River in China, cable car in San Francisco, dog sled in Alaska, the famed cross-continental Indian Pacific train between Sydney and Perth in her native Australia, and a boat ride across the Baltic from Sweden to Skype's supreme HQ in Tallinn, Estonia to finish up June 6, "D-Day."" Unsurprisingly this journey has a large array of social media initiatives attached to it. 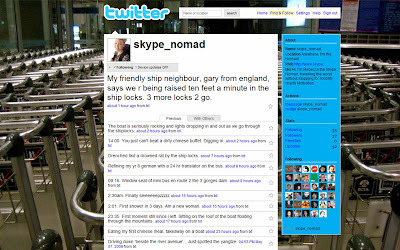 From Skype users being able to connect to her in real time through Skype to the obligatory Facebook / MySpace pages as well as use of Flickr, Twitter and more niche sites like Dopplr. There is also a Skype Nomad 'traditional' blog which contains links to all her social media and also a 3D globe that shows her progress. Everything is updated through Skype mobile internet and I assume these adventures will all be aggregated into a book once the trip has finished? The Skype Nomad project is another interesting way of promoting a product by going to extreme lengths to demonstrate its functionality, whilst using social media and PR to bring the whole thing to life. It is also commendable that this project is raising money for charity at the same time.